I first saw Darren Byers in August 2007, the home match against Kendal Town.He looked to be off the pace a bit and seemed too slight to cope with the rough and tumble of Unibond Premier League football. Appearences can be deceptive of course. Over the next month or so it became clear he had the killer instinct required of forwards at every level. Two poachers goals at Witton and Leek Town helped Cables to vital wins.This was followed by Byers scoring the winner in a narrow 1-0 home win over Ashton United at Hope Street. When you realise Cables escaped relegation at the end of the 07/08 season by the skins of their teeth the value of these goals can’t be underestimated. In 2009/10 he managed to amass 19 goals despite Cables winning only 5 league games. 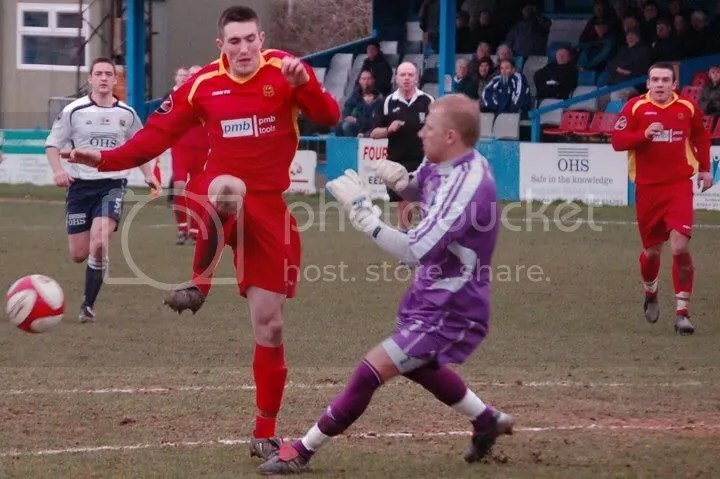 The hat trick at Marine may stand out, as does the spectacular equaliser against Eastwood Town away. For me the goal that summed up Darren Byers was scored in the home match against FC United. Set free by a precise through ball Byers raced to the edge of the FCUM area before firing an angled drive beyond the keeper and into the far corner of the net.No hit and hope, no luck, no poor defending, just a clinical finish. Players at every level want to play at the highest possible level of football. Darren’s move to Burscough is just part of that natural progression, and in Darren’s case he’ll probably move on again in the future to better things. Good luck Darren and thanks for the memories.